How long will teachers continue to give points to students who bring in boxes of tissues? Why do I make all those comments if students just throw them in the trash? Why should Erik be penalized for not doing any homework if he knows the material? Why do my students have to know how old the Curtis boys (from The Outsiders) are? Why don’t my kids revise their work? What extra credit can I do? ​Can I redo this if I fail? If I revise this assignment, what will my grade be? Why do I have to take grammar quizzes if my writing is good? ​How many points will it be off if I turn it in late? Create track records to keep track of behaviors. Barnes, M. (2015). Assessment 3.0: Throw out your grade book and INSPIRE learning. Thousand Oaks, CA: Corwin. Black, P. & Wiliam, D. (2001, Nov. 6) Inside the Black Box: Raising Standards Through Classroom Assessment. Bower, J. (2011, May 11). My de-grading philosophy Q & A [blog post]. Retrieved from for the love of learning at www.joebower.org/2011/05/my-grading-philosophy-q.html . Hattie J., & Timperly H. (2007). The power of feedback. Review of Educational Research, 77(1), 81-112. Kohn, Alfie. "From Degrading to De-Grading," High School Magazine, March 1999. O'Connor, K. (2011). A repair Kit for Grading: 15 fixes for broken grades. Boston: Pearson. Solarz, P. (2015): Learn Like a Pirate: Empower your students to collaborate, lead, and succeed. San Diego, CA: Dave Burgess Consulting. Westman, L. (2017, March 15). "Standards Based Grading Made My Kid Average"
Wormeli, R. (2006). Fair Isn't Always Equal. Portland, ME: Stenhouse. Check an old gradebook of yours, if you’ve still got it. If not, make up a fake one. Add in random marks (percentages, letters) for assignments you usually mark. Now average the scores for each student. Who is the “C” student, and why? 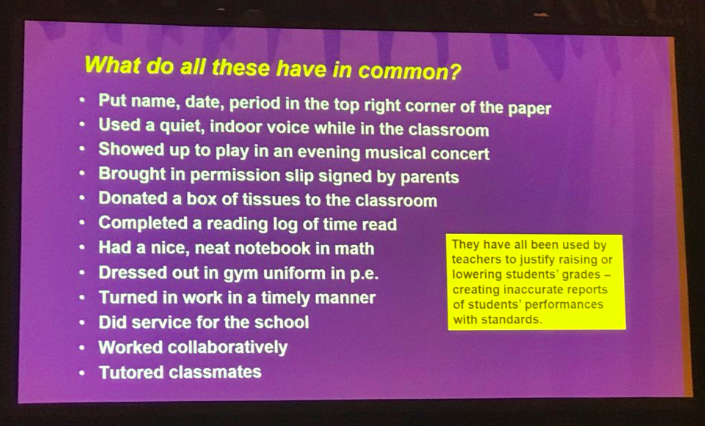 What makes an “A” student in your class? Start to notice averages, and see what types of stories they tell. What would parents get out of just one letter grade at the end of each grading period? Where are you asking for compliance instead of learning? 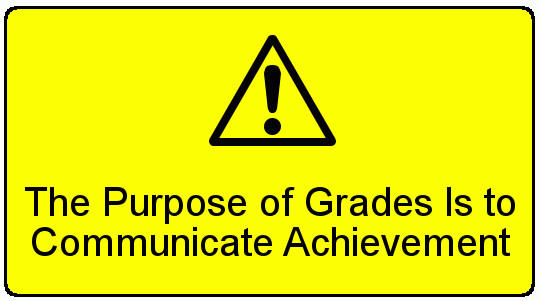 Look through the rubrics and grades you typically use, and see where you can cut points that do not show achievement. What, if anything, do you feel is wrong with the way you or your colleagues are grading? If you know something is wrong with your current system, how long will it be before you feel ready to make adjustments? Set a date as a goal, and put it on your to-do list. Choose something from the “further reading” section above or look online for videos from Rick Wormeli or presentation slides from Ken O’Connor. Check it out with a colleague. Have the conversations that will help your students succeed.